The Sun Facts for Kids: This lesson includes a great deal of the Sun facts for kids. A star is a big ball of hot, glowing (shining/ shimmering) gas. Stars are born from swirling (spinning) clouds of gas and dust. There are stars that have exploded (burst) and stars that are just being born. What are the gases that make stars? What do the stars give off? Stars come in different colours. They can be; red, orange, yellow, white or blue. The colour of a star depends on how hot the star is. The coolest stars are reddish and the hottest stars are bluish. Most of the stars are million times bigger than the Earth. How bright is a star? Stars in the sky look brighter. Stars can produce their own light. They are bright shining objects. So they can twinkle in the sky. Where do stars go in the day time? Stars don’t go away in the day time. As the sky gets brighter, the stars seem to get dimmer. Can we live in stars? Stars are places where we cannot live, because heat is so great that no living being cannot live there. What is the closest star to us? Sun is a star. It is a big ball of hot, glowing (shining/ shimmering) gas. There are many stars in the sky bigger than the Sun. But in our solar system the biggest star is the Sun. 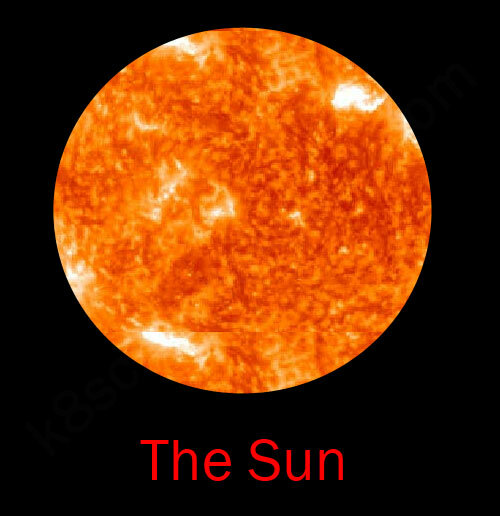 Sun is also called Solar. What are the gases that Sun is made up of? What does the Sun give off? Our Sun is a yellow star. What is the shape of the Sun? Sun is shaped like a sphere. 1) Sun is huge compared to Earth. It is over a million times bigger than the Earth. Sun looks small only because it is far away from us. E.g. – If the Sun were hollow, a million Earths could fit inside it. 2) Sun is small compared to other stars. Many stars are much bigger than Sun. Sun looks bigger than the other stars because it is much nearer to us. So Sun is only a small star. Sun is about 150 million kilometers away from the Earth. Other stars are much further away than this. Our Sun is about 4.6 billion years old. What are the two parts of Sun? To study about the Sun easily, first we divide it into two parts as follows. 1) The surface of the Sun. What is happening at the surface of the Sun? The surface of the Sun is made up of white, hot gases like hydrogen and helium. The surface of Sun is never still. Great fountains (way of spraying) of glowing gases shoot out from it. The temperature at the surface of Sun is about 6000°C. What is happening at the centre of Sun (The core of the Sun)? Deep inside the Sun, nuclear reactions are taking place all the time. These nuclear reactions produce Sun’s heat and light. The temperature at the centre of the Sun is about 16 million °C. Sun is very important to us. Even ancient people knew the Sun was very important. They thought the Sun was a god. Following are some of the importance of the Sun. Sun keeps us warm, otherwise it would be too cold to survive (stay alive) on Earth. Sun makes us see in daylight. Sun causes the weather we have on Earth. Sun gives us light and heat to do many things in our day to day life. We use the Sun’s energy to heat water and dry clothes. Fossil fuels that we use today, such as oil and natural gas, come from ancient plant and animal life that once absorbed up Sun’s energy. We use this energy to cook our food, warm our houses, run our cars and make electricity. People use sunlight to produce Solar Energy. Plants need sunlight to make their food (to do photosynthesis). All the other living things depend on this food. When plants make food using sunlight they make oxygen as a waste product. Oxygen is needed by all living things. Hope you’ve enjoyed the Sun facts for kids lesson. Also, click here to learn about the Moon.